Collaboration sessions in Visual Studio Live Share are powerful in that they allow any number of people to join in a session and collaboratively edit, debug and more. However, given this level of access, you undoubtedly will be interested in the security features Live Share provides. In this article, we'll provide some recommendations and options for securing your environment as needed. As with any collaboration tool, remember that you should only share your code, content, and applications with people you trust. All connections in Visual Studio Live Share are SSH or SSL encrypted and authenticated against a central service to ensure that only those in the collaboration session can gain access to its content. By default, Live Share attempts a direct connection and falls back on a cloud relay if a connection between the guest and the host cannot be established. Note that Live Share's cloud relay does not persist any traffic routed through it and does not "snoop" the traffic in any way. However, if you'd prefer not to use the relay you can change settings to always connect directly. To find out more about altering these behaviors and Live Share's connectivity requirements, see connectivity requirements for Live Share. Each time you start a new collaboration session, Live Share generates a new unique identifier that is placed in the invitation link. These links provide a solid, secure foundation to invite those you trust since the identifier in the link is "non-guessable" and is only valid for the duration of a single collaboration session. As a host, you are automatically notified whenever a guest joins the collaboration session. Better still, the notification gives you the ability to remove a guest that has joined if for some reason you do not know them. (For example, if you accidentally posted your link on a company-wide chat system and a random employee joined.) Simply click on the "Remove" button in the notification that appears and they will be ejected from the collaboration session. In VS Code, even if you have dismissed a join notification, you also have the ability to remove a participant after that. 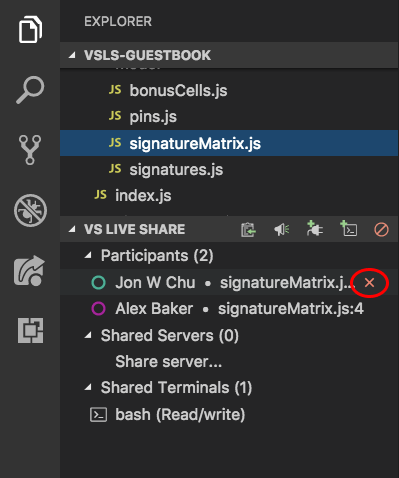 By opening the Live Share view in the Explorer or the custom tab in the VS Code activity bar, you can hover over or right-click a participant's name and select the "Remove participant" icon or option. Typically, participants that join a collaboration session will be signed into Live Share using a Microsoft work or school account (AAD), personal Microsoft account, or GitHub account. While the "notification + remove" default for signed in users provides a good mix of speed and control for these guests, you may want to lock things down a bit more if you are doing something sensitive. In addition, in certain circumstances forcing all guests to sign in to join a collaboration session can be problematic. Examples include asking someone new to Live Share to join as a guest, classroom/learning scenarios, or when collaborating with someone who does not have one of the supported account types. For these reasons, Live Share can allow users that are not signed in to join collaboration sessions as read-only guests. While the host needs to approve these guests before they can join by default, you may want to either disallow these "anonymous" guests or always approve them instead. In Visual Studio, set Tools > Options > Live Share > "Require guest approval" to True. From this point forward, you'll be asked to approve each guest that joins. As a guest, if you join a session where the host has this setting enabled, you'll be notified in the status bar or join dialog that Live Share is waiting on the host to approve. As described above, Live Share can be configured to allow users that are not signed in to join a collaboration session as read-only guests. While these "anonymous" guests must enter a name when joining, a simple name does not provide the same level of assurance as a real sign-in. Therefore, by default, the host is prompted to approve any anonymous guest regardless of the "require guest approval" setting described above. In VS Code, set liveshare.anonymousGuestApproval in settings.json (File > Preferences > Settings) to accept, reject, or prompt (the default) as appropriate. In Visual Studio, set Tools > Options > Live Share > "Anonymous guest approval" to Accept, Reject, or Prompt (the default) as appropriate. Regardless, remember that you should only send Live Share invitation links to people you trust. As a guest, Live Share's remote model gives you quick read/write access to files and folders the host has shared with you without having to sync the entire contents of a project. You can therefore independently navigate and edit files in the entire shared file tree. However, this freedom does pose some risks to the host. In concept, a developer could opt to go in and modify source code without your knowledge or see sensitive source code or "secrets" located somewhere in the shared file tree. Consequently, as a host, you may not always want the guest to have access to the entirety of a project you are sharing. Thankfully, an added advantage of this remote model is that you can opt to "exclude" files you do not want to share with anyone without sacrificing on functionality. Your guests can still participate in things like debugging sessions that would normally require access to these files if they wanted to do so on their own. You can accomplish this by adding a .vsls.json file to the folder or project you are sharing. Any settings you add to this json formatted file changes how Live Share processes files. In addition to providing you direct control, these files can also be committed to source control so anyone cloning a project will be able to take advantage of these rules with no additional effort on their part. You can also make the all files/folders you share read-only when you start a collaboration session. See below for details. Let's walk through how these properties change what guests can do. The excludeFiles property allows you to specify a list of glob file patterns (very much like those found .gitignore files) that prevents Live Share from opening certain files or folders for guests. Be aware that this is inclusive of scenarios like a guest following or jumping to your edit location, stepping into a file during collaborative debugging, any code navigation features like go to definition, and more. It is intended for files you never want to share under any circumstances like those containing secrets, certificates, or passwords. For example, since they control security, .vsls.json files are always excluded. The hideFiles property is similar, but not quite as strict. These files are simply hidden from the file tree. For example, if you happened to step into one of these files during debugging, it is still opened in the editor. This property is primarily useful if you do not have a .gitignore file setup (as would be the case if you are using a different source control system) or if you simply want to augment what is already there to avoid clutter or confusion. none .gitignore contents are visible to guests in the file tree (assuming they are not filtered by a guest editor setting). hide The default. Globs inside .gitignore are processed as if they were in the "hideFiles" property. exclude Globs inside .gitignore are processed as if they were in the "excludeFiles" property. Finally, just like .gitignore, .vsls.json files can be placed in sub-folders. Hide/exclude rules are determined by starting with the .vsls.json file in the root folder you have shared (if present) and then walking through at each sub-folder from there leading to a given file to look for .vsls.json files to process. The contents of .vsls.json files in folders farther down the file tree then supplement (or override) rules established at higher levels. By default, Live Share will also share any files the host opens that are external to the shared folder / solution. This makes it easy to quickly open up other related files without having to re-share. Sometimes when you share your code as a host, you don't want your guests to make edits. You might need your guest to take a look at some of your code, or you are showing your project to a large number of guests and do not want any unnecessary or accidental edits to be made. Live Share offers the ability to share projects in read-only mode. As a host, when sharing, you have the option to enable read-only mode for a collaboration session. When a guest joins, they will not be able to make edits to the code, though you can still see each other's cursors and highlights as well as navigate through the project. You can still co-debug with guests while in read-only mode. Guests will not have the ability to step through the debugging process, but can still add or remove breakpoints, and inspect variables. Additionally, you can still share servers and terminals (read-only) with guests. When you're tackling tough coding problems or bugs, having an extra pair of eyes when debugging can be really useful. 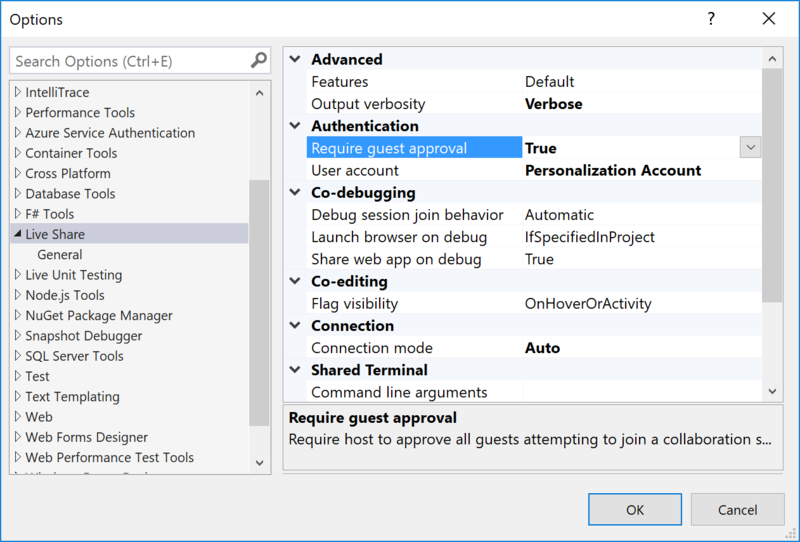 Visual Studio Live Share enables "collaborative debugging" or "co-debugging" by sharing the debugging session with all guests whenever the host starts debugging. As a host, you are in complete control over when a debugging session starts or stops, but co-debugging does pose some risks if you are sharing with someone you do not trust. Live Share allows guests you invite to run console/REPL commands and there is therefore a risk of a malicious actor running a command you would not want them to run. Consequently, you should only co-debug with those you trust. When co-debugging, it can be really useful to get access to different parts of the application being served up by the host for the debugging session. You may want to access the app in a browser, access a local database, or hit a REST endpoint from your tools. Live Share lets you "share a server" which maps a local port on the host's machine to the exact same port on guest's machine. As a guest, you can then interact with the application exactly as if it was running locally on your machine (e.g. the host and guest can both access a web app running on http://localhost:3000). However, as a host, you should be very selective with the ports you share with guests and only share application ports rather system ports. For guests, shared ports will behave exactly like they would if the server/service was running on their own machine. This is very useful, but if the wrong port is shared can also be risky. For this reason, Live Share does not make any assumptions about what should or should not be shared without a configuration setting and the host performing an action. In Visual Studio, the web application port specified in ASP.NET projects is automatically shared during debugging only to facilitate guest access to the web app when running. However, you can turn off this automation by setting Tools > Options > Live Share > "Share web app on debug" to "False" if you prefer. In either case, exercise care when sharing additional ports. Modern development makes frequent use of a wide array of command line tools. Fortunately, Live Share allows you as a host to optionally "share a terminal" with guests. The shared terminal can be read-only or fully collaborative so both you and the guests can run commands and see the results. As the host, you're able to allow other collaborators to either just see the output or to use any number of command line tools to run tests, builds, or even triage environment-specific problems. Only hosts can start shared terminals to prevent guests from starting one up and doing something you are not expecting or watching. When you start a shared terminal as a host, you can specify whether it should be read-only or read/write. When the terminal is read/write, everyone can type in the terminal including the host which makes it easy to intervene if a guest is doing something you do not like. However, to be safe, you should only give read/write access to guests when you know they actually need it and stick with read-only terminals for scenarios where you just want the guest to see the output of any commands you run. When signing in using a Microsoft backed work or school email address you may see a message saying "Need admin approval" when signing in. This is because Live Share requires read access to user information for its security features and your Azure AD tenant is set up to require “admin consent” for new applications accessing the contents of the directory. This would only need to be done once for anyone using Live Share. See here and here for details.